A lot of options for floor cleaning are available in market but choosing one carefully can make your task much easier. However wrong choice can not only make your task difficult but also leads to regular breakdowns. Read on to know, how to choose the best floor cleaning equipment. When thinking about floor cleaning equipment, the first option that comes in mind is floor scrubber dryers which are available in different types, size variations and mode of cleaning. Here are some features that are important to consider while choosing floor scrubbers and dryers. A mains power cleaning machine is a good choice because it is cheaper and can be used for several hours because it comes without battery that may run out of charge. However, if there are people around on cleaning area, goo for the battery operated option. Disc type floor scrubbers are more common in use. They have disc like brush or pad holder when using pads. They are more versatile because pads can be changed to suit the floor type. On the other hand cylindrical machines have roller type brushes that are good at cleaning heavy dirt on rough finishes but the brushes wear out quickly consequently making the running cost higher. Scrubber Dryers are available in both Walk Behind and Ride On options but the latter is preferred as it is more convenient to use, especially when using for longer period of time. Besides the features mentioned above, choice of chemicals, user training and maintenance are also important factors to be considered when buying a floor cleaning machine. Compact Design – easy cleaning in small spaces. Anti Tip System – Prevents the machine from tipping. On-Board Charging – Easy and convenient, just plug and go. Fully sealed low maintenance Gel batteries. Flexifill System – Filling and emptying becomes easy with the flexifill system. Easy Operator Control – Has fully adjustable speed control. Safety Features – Emergency stop button, removable power off key, horn button and built in hazard warning light make the use much safer. 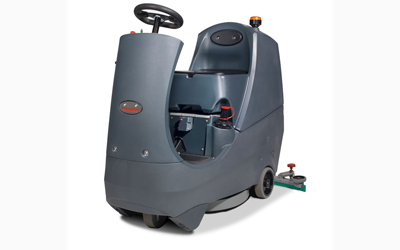 To know more about our Floor Cleaning Machines, Click here.